Postcolonialism has become one of the most influential paradigms in cultural studies as well as in various area studies, and their influence in the social sciences seems to be on the rise in the last decades. However, the English language discourses on China payed little attention to postcolonial theories so far. 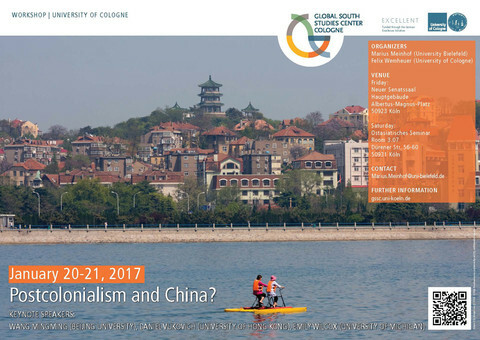 In spite of some fruitful critique of the earliest postcolonial authors such as Edward Said, China studies and related fields seem to have widely ignored the debates in postcolonial studies, and seem to be unaware of most of its recent developments. However, a (critical) engagement with postcolonial theory seems to be, almost unavoidable for future debates on China: Memories of colonialism have a relevance in China that cannot be plausibly reduced to anti-western propaganda. At the same time, it is unclear even today how to address these colonial experiences and the way they shaped Chinese history since the 19th century: As a variety of colonialism, as semi-colonialism, or as multiple colonialisms and semi-colonialisms within the same country? How could colonialism leave a heritage that is visible even in current debates about national modernization and development, and the mission of overcoming Chinese “backwardness”. When answering this question, it seems necessary to consider the possibility of globally entangled, multiple power structures, in which Chinese people might simultaneously be dominated and dominating, represented and representing, peripheral and central - especially given the “rise of China” within a still western dominated world order. Wang Mingming (Beijing University): Is postcolonialism relevant to China?